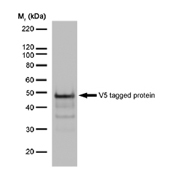 Our V5 tag antibody range includes the highly cited SV5-Pk1 antibody clone and a selection of directly conjugated antibodies for variety of applications. Like c-myc and HA tags, the V5 tag is a small epitope tag (IPNPLLGLD), which can be placed by molecular cloning at the N- or C-terminus of a protein of choice. Via detection of the tag with V5 antibodies crucial information about the protein of interest can be unveiled. For example the cellular location of the protein of interest can be determined via immunofluorescence or western blotting of cell fractions. Interaction partners of the protein of interest can be identified via performing pull down/ immunoprecipitation experiments with beads coupled to V5 antibodies. Our popular V5 antibodies have been tested and cited in all these crucial applications and many more. We have a comprehensive portfolio consisting of five V5 tag antibodies recognizing different epitopes within the small Pk tag – this allows you to select the one best suited for your experimental set up. Want to know more about the V5 tag? Have a look at our epitope tag reference list. Alexa Fluor® is a trademark of Molecular Probes Inc, OR, USA.